During the most recent ice age, abrupt changes in the Arctic climate were transmitted through the ocean to Antarctica. An atmospheric link between the two hemispheres has now been identified across the Antarctic continent. Nerilie J. Abram is at the Research School of Earth Sciences and the Centre of Excellence for Climate Extremes, Australian National University, ACT 2601, Australia. There are no precise analogues in Earth’s past for the rapid warming that the world is now facing as a result of rising levels of greenhouse gases in the atmosphere. However, some periods of Earth’s history can reveal valuable details of the way in which different parts of the climate system respond and interact1. Of particular interest are intervals of large and abrupt warming in the Arctic that occurred episodically during the most recent ice age (about 115,000–11,700 years ago). These climate shifts are known as Dansgaard–Oeschger events, and saw temperatures in Greenland jump by more than 10 °C in a matter of decades2. On page 681, Buizert et al.3 report that these events altered the position of the westerly winds across the Southern Hemisphere — a finding that has implications for global ocean circulation and atmospheric carbon dioxide. Past rapid warming events in the Northern Hemisphere give researchers a way of addressing fundamental questions in climate science. In particular, how do changes in the climate of one hemisphere affect that of the other? And how, and at what rate, do these changes propagate? The connection between hemispheres is important for determining how energy moves through the Earth system and alters the climate in different places around the globe. The simplest model to explain the relationships seen between Greenland and Antarctic temperatures during Dansgaard–Oeschger events is the ‘bipolar see-saw’ movement of heat between the hemispheres through the global ocean4. In this model, the Greenland temperature jumps abruptly into its warm phase when the overturning circulation — the sinking of surface waters to the deep ocean — in the North Atlantic Ocean speeds up. This adjustment in ocean circulation concentrates heat in the Northern Hemisphere and causes Antarctica to gradually cool. It takes about 200 years for the ocean changes in the North Atlantic to start affecting the Antarctic temperature5. This lag reflects the time that it takes for accumulated energy to penetrate north of the current that circles Antarctica and to begin to be absorbed into subsurface levels of the global ocean6. The opposite happens when the overturning circulation in the North Atlantic slows or stops, causing Greenland to shift quickly into a cold state similar to that associated with an ice age. It again takes about 200 years from when this rapid change occurs in the Arctic to when Antarctica begins to warm. The longer the cold state persists in Greenland, the more Antarctica warms through this see-saw mechanism of the deep ocean7. But this is not the full story. The atmosphere also provides a means by which climate signals propagate between the hemispheres, in a much faster way than through the ocean. Abrupt warming events in the Arctic pull the meteorological equator — a band of tropical storm clouds that circle the globe near the Equator — farther north, and, along with it, the rainfall patterns associated with the Asian summer monsoon. 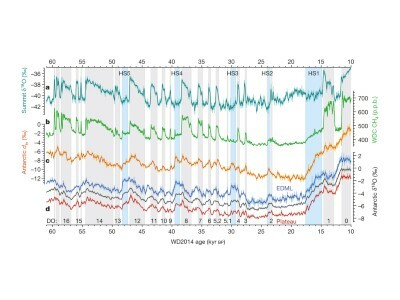 In 2017, a reinterpretation of water-isotope signals in an Antarctic ice core identified a near-instantaneous response of atmospheric circulation to changes in Arctic climate that occurred in the most recent ice age, all the way south to West Antarctica8. However, whether this response occurred throughout the Southern Hemisphere, or was more localized, remained unclear. Buizert and colleagues present the first Antarctic-wide evidence for a rapid atmospheric coupling of the position of the westerly winds around the whole of the Southern Ocean to past abrupt climate events in the Arctic (Fig. 1). Identifying these pervasive fluctuations in wind position, which happened on a decadal timescale tens of thousands of years ago, required the precise synchronization of ages for ice cores from across the Antarctic continent. Ice-core ages from Greenland have been linked to those from Antarctica using the methane composition of bubbles in the exceedingly well-resolved ice core from the West Antarctic Ice Sheet Divide5. Atmospheric methane is quickly mixed across the hemispheres, and so can be considered as globally synchronous. Past fluctuations in methane abundance mimicked abrupt changes in Greenland temperature and therefore provide a way of precisely interrogating the timing of climate events between the Arctic and the Antarctic. Buizert et al. took the next step in synchronizing the West Antarctic Ice Sheet Divide record with four other Antarctic ice cores by identifying characteristic sequences of volcanic eruptions preserved in the sulfate levels in Antarctic ice. Only then were the authors able to identify the superimposed oceanic and atmospheric signals that occurred across Antarctica in response to past rapid changes in Arctic climate. The classic see-saw of heat between the hemispheres through the ocean can explain the delayed and gradual changes in Antarctic temperature that accompanied past abrupt shifts in Greenland temperature. But Buizert and co-workers’ study suggests that superimposed on these slow ocean changes were an almost synchronous northward shift in the westerly winds circling Antarctica when Greenland moved into its warm phase — and, vice versa, a southward shift in these winds during cool Greenland events. This atmospheric response modulated the latitude in the Southern Ocean that formed the source of the moisture that fell as snow over Antarctica. A one-to-one relationship has previously been identified between the duration of Greenland temperature events and the magnitude of the ensuing temperature response in Antarctica through the ocean mechanism7. Similarly, the authors find that the atmospheric response seems to scale so that stronger Greenland events result in a larger climatic signal in Antarctica and the Southern Ocean. An atmospheric link tying changes in Arctic climate to the Antarctic has previously been hypothesized on the basis of climate-model responses in experiments designed to mimic aspects of Dansgaard–Oeschger events6. The current work provides the observational data to prove the existence of this link. It is time to move beyond considering only the Atlantic Ocean and century-scale time lags when thinking about how the Arctic and the Antarctic are climatically connected5. Buizert and colleagues’ identification of a rapid atmospheric link between climates at the poles has implications for our understanding of current climate change. Today, the Arctic is warming at about twice the rate of the global average; however, continent-scale warming of the Antarctic that is expected from climate simulations has not yet been clearly observed9,10. Changes in Antarctic sea ice are also not following expectations based on models10. Meanwhile, the westerly winds of the Southern Hemisphere have been shifting rapidly southwards, affecting water security in cities such as Perth in Australia and Cape Town in South Africa, and potentially having global consequences by altering the movement of heat and carbon dioxide between the atmosphere and the ocean11. 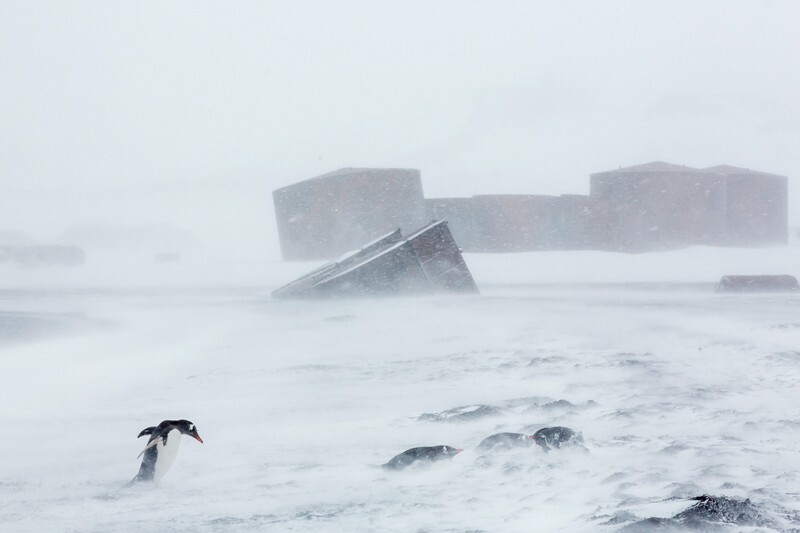 Many challenges remain in accurately predicting how, and how quickly, the behaviour of Antarctica and the Southern Ocean will change in a warming climate. Nevertheless, the authors have provided a glimpse of the natural changes in behaviour — both rapid and slow — that occurred tens of thousands of years ago. These results provide a basis for progress in unravelling the current scientific mysteries of how the ocean and the atmosphere at the poles respond to rapid changes in climate. Fischer, H. et al. Nature Geosci. 11, 474–485 (2018). Kindler, P. et al. Clim. Past 10, 887–902 (2014). Buizert, C. et al. Nature 563, 681–685 (2018). Stocker, T. F. & Johnsen, S. J. Paleoceanography 18, 1087 (2003). WAIS Divide Project Members. Nature 520, 661–665 (2015). Pedro, J. B. et al. Quat. Sci. Rev. 192, 27–46 (2018). EPICA Community Members. Nature 444, 195–198 (2006). Markle, B. R. et al. Nature Geosci. 10, 36–40 (2017). Abram, N. J. et al. Nature 536, 411–418 (2016). Jones, J. M. et al. Nature Clim. Change 6, 917–926 (2016). Toggweiler, J. R. & Russell, J. Nature 451, 286–288 (2008).